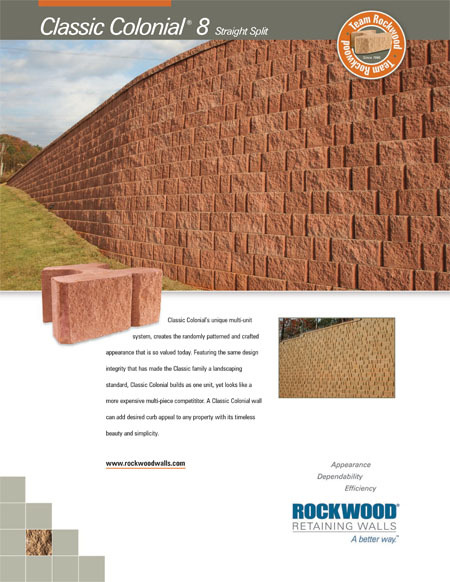 Rockwood's Colonial series offers you the convenience of two block in one! 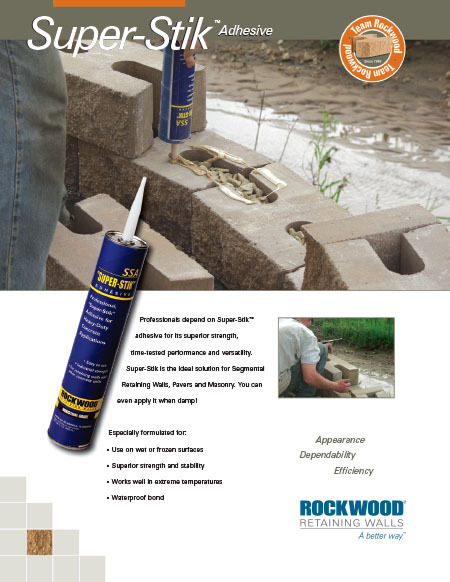 Classic Colonial® 8 combines the attractive features of a natural stonewall, with the proven performance of the Classic® system. Designers will appreciate Classic Colonial 8 for its natural curb appeal, while engineers will respect its proven strength in demanding wall applications. What does the "Colonial" name signify? 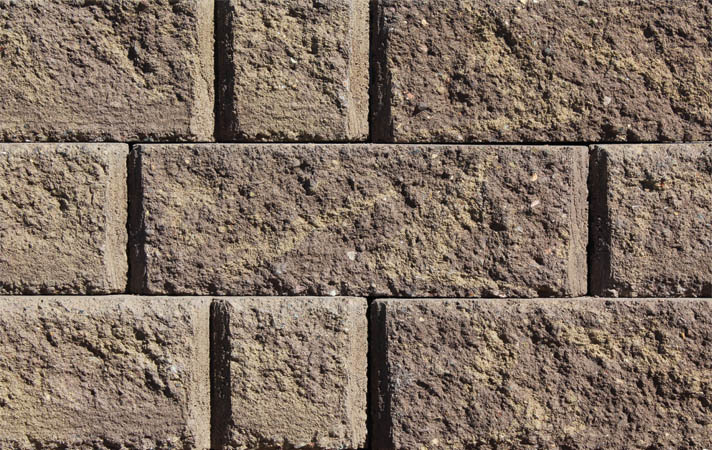 Colonial is the designation used for blocks that feature a vertically split channel. 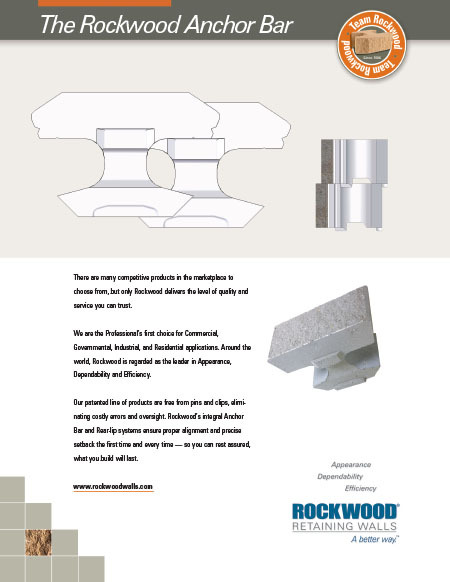 This split creates the appearance of two different sized blocks but in the convenience and strength of a single unit. The number "8" simply refers to the the height of the block in inches, which helps to differentiate it between the two versions; 6 and 8. Colonial 18 18 x 12 x 8" H 1 sq. ft. 85 lbs. 12 2 24 24 sq. ft. 2,090 lbs. Colonial 6/12 18 x 12 x 8" H 1 sq. ft. 85 lbs. 12 2 24 24 sq. ft. 2,090 lbs. Base Block 18 x 12 x 8" H 1 sq. ft. 85 lbs. 12 2 24 24 sq. ft. 2,090 lbs. Half Block 9 x 12 x 8" H 0.50 sq. ft. 39 lbs. 12 1 12 6 sq. ft. 518 lbs. Corner Unit 13 x 5.5 x 8" H 0.72 sq. ft. 40 lbs. 12 1 12 8.64 sq. ft. 530 lbs. Available by layer or pallet. Colonial 6/12 and 18 palletized separately.